What a week! TYO has come out in Washington, and we did it with a splash! 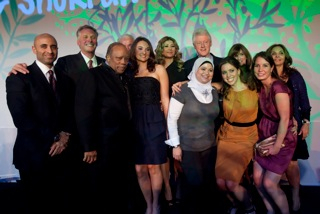 Check out some video and commentary at the links below – more coming soon… Here’s the TYO team onstage at the Gala last night with Bill Clinton, Quincy Jones, Ambassador Yousef Al Otaiba, event chairs Terry McAuliffe and Samia Farouki and TYO Founder Hani Masri! Clinton was at DC’s Ritz Carlton to keynote along with former British first lady and Matrix Chambers legal firm legend Cherie Blair, chair and founder of the Cherie Blair Foundation for Women, a fundraising gala for a surprisingly successful NGO that works with young children and women in Palestine. Tomorrow’s Youth Organization, an NGO whose mission is to empower women and children of Palestine, hosted former US President Bill Clinton on Thursday. The event took place in Washington, DC and keynote speakers included former British first lady and Matrix Chambers legal firm legend Cherie Blair, chair and founder of the Cherie Blair Foundation for Women. Last night I had the honor of DJing the first annual Tomorrow’s Youth Organization Gala at the Ritz Carlton. It was an amazing event for an amazing organization. Honored guests included Pres. Bill Clinton, Quincy Jones and Cherie Blair (wife of Former PM Tony Blair). The ballroom at The Ritz -Carlton was filled to capacity last night when co-chairs Terry McAuliffe and Samia Farouki hosted a gala for the first time to benefit Tomorrow’s Youth Organization, a group whose mission is to work in disadvantaged areas of the Middle East to help children, teens and their parents build strong, responsible communities. TYO is the brainchild of Hani Masri who founded the organization in 2007 with a vision and a mission to improve the lives of those suffering from poverty and violence.